First of all I am very happy to do the guest for my favorite blogger (friend) Sala of Veggiebelly. Her photography speaks more than thousand words. You will get to know the reason behind my words when you head over to Sala's Blog Veggie Belly. I am very much honored to do guest post for Sala and I am very happy to dedicate my favorite dessert from my childhood " Mishti Doi" for her. It’s been long time I wanted to post this recipe in my space. But somehow my blog is fed with lot of dessert recipes these days so I miss making this Mishti Doi. 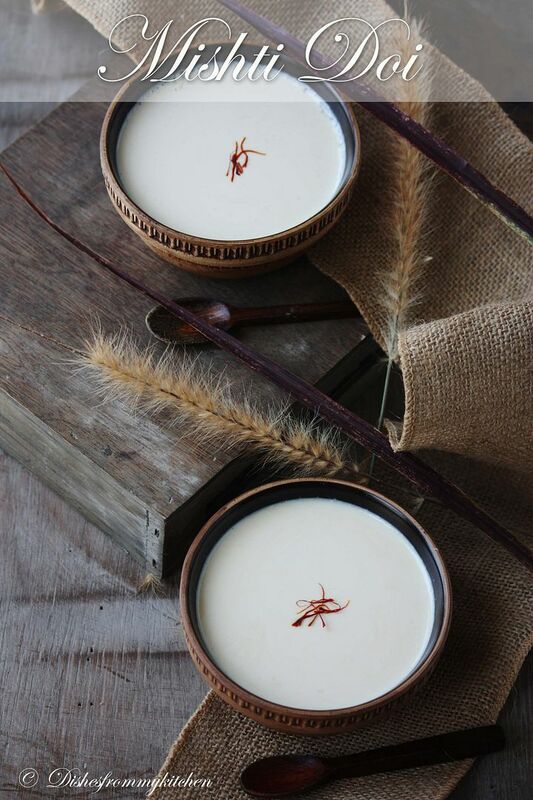 Mishti Doi is a Bengali dessert. Bengal is a part of East India and Bengalis are very famous for their sweet preparation. 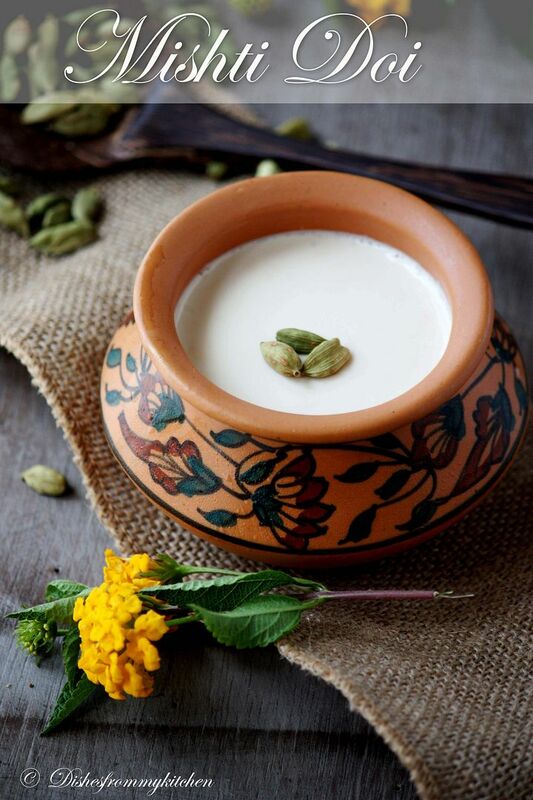 Mishti Doi is among their well known dessert, I have enjoyed having them from my childhood days. Whenever my dad visits Bangalore he will never miss to have them, similarly whenever he takes us to Bangalore we used to enjoy them in a cute earthen pot in a famous Bengali sweet shop. Please head over to Sala's space for more pictures and recipe. Do try this dessert; I am sure you will be addicted to this dessert. Don't forget to read her cross country trip post Part 1 & Part 2 which I enjoyed so much. The tones of the photographs so calming, rustic and elegant at the same time. Love the wood boards and your props. Impressive recipe and clicks.Luv it. Wonderful post, classic pictures Pavi! Yummy Pictures & in Particular I love the burlap runner that gives the capture a different dimension...... Aah! Mishti DOI!!! I too love Mishti doi and mentioned how much i love it while writing a post for rasgulla last night on my blog. Soon after i see this post in your blog. Thank you! Awesome clicks too. Heading over to veggiebelly now. Wow .. looks yummy. Nice clicks as always. Lovely presentation Pavi...this looks so yumm! Another beautiful and tempting dish from uuuuuuu. I'll hop there to find out about this dessert but wanted to stop by first to tell you that it looks delicious indeed and that I love the ceramic bowl on the first photo. Adorable! Ufffff.... mind blowing and amazing clicks as always. Incredible..A creamy & royal sweet dish!!! I'm loving it Pavithra. Its like any recipe I see here at ur space I have this feeling I have to make it right away. Your Clicks as usual are just spectacular and Misti Doi is on my list to try soon. yummy...mishti doi is my fav...but i didnt knw hw 2 mk...thanks for sharing ! !